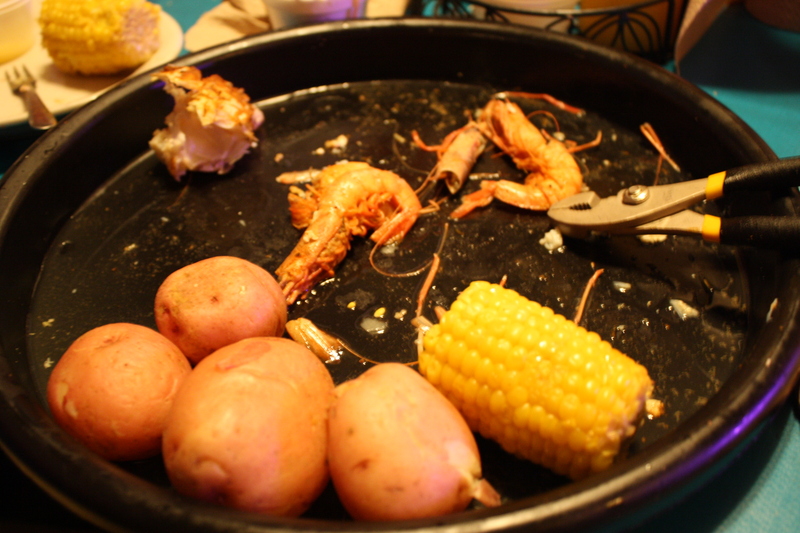 When we ate at The Steamer, it was almost the end of our trip in Gulf Shores. 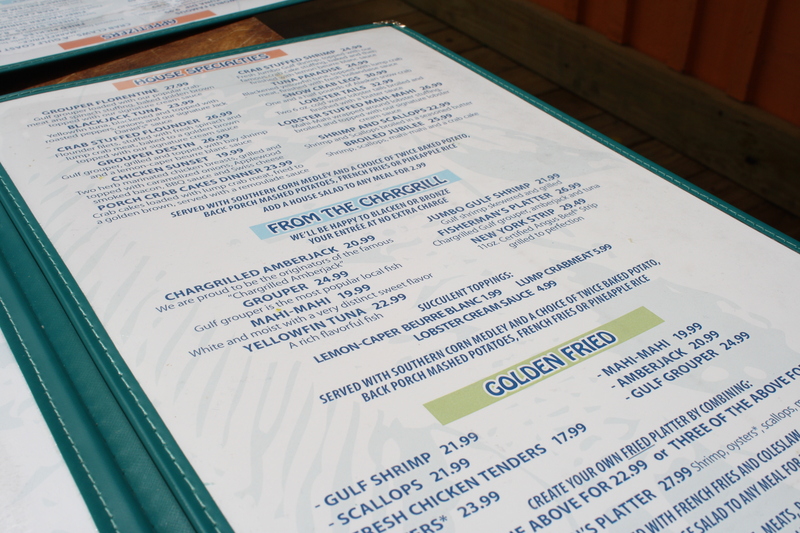 We had almost had our fill of fresh seafood, and we were almost out of places to eat. For some reason, we decided to try this place. It was off the main road and smack dab beside a souvenir shop-you know, the one with the shark in the front and pirate ship in the back. The wait? Looong, but we were fine. Our expectations and appetites weren’t very demanding. The atmosphere? From where we were seated, blech. When we were seated after the very long wait, we were given probably the worst table in the place. It was across from the hostess stand and directly by the entrance outside. We were so close to the people waiting that people were staring at our food. One guy actually leaned over the railing and asked for some crackers. 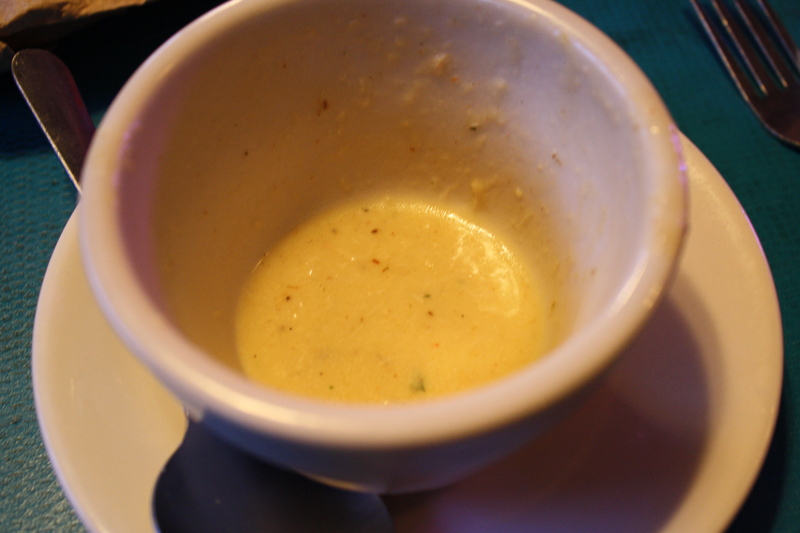 My sister started out with the crab bisque, and she was nice enough to share a bite. It was the best ever. I dream about it during boring teacher meetings. Top notch, I tell ya. Mr. Opinionated and I shared the Big Lagoon Steamer Tray. Divine. See how good it was? Not one person in our group had a bad meal even if our table wasn’t the best. Luckily, or unluckily, we loved, loved, loved The Steamer. Luckily, because we had such good food. Unluckily, because we ate there so late in our trip, and we didn’t have a chance to go back on that trip. 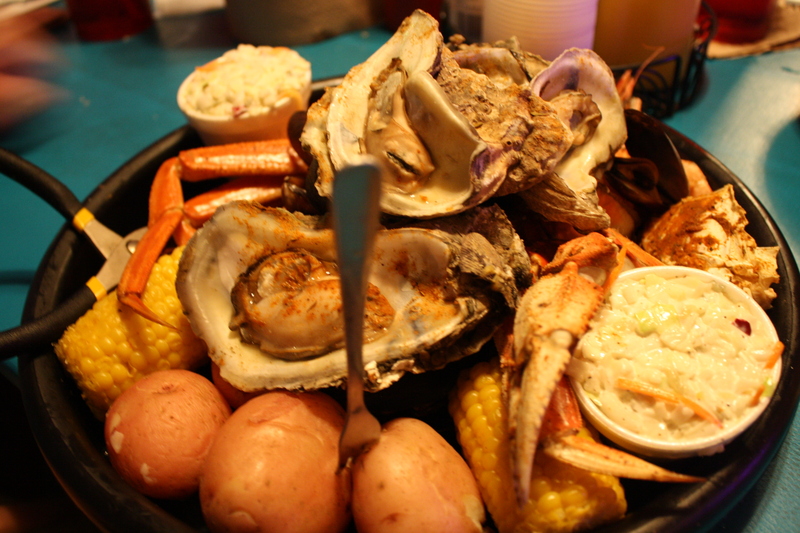 However, The Steamer is now on our list of places to eat in Gulf Shores. 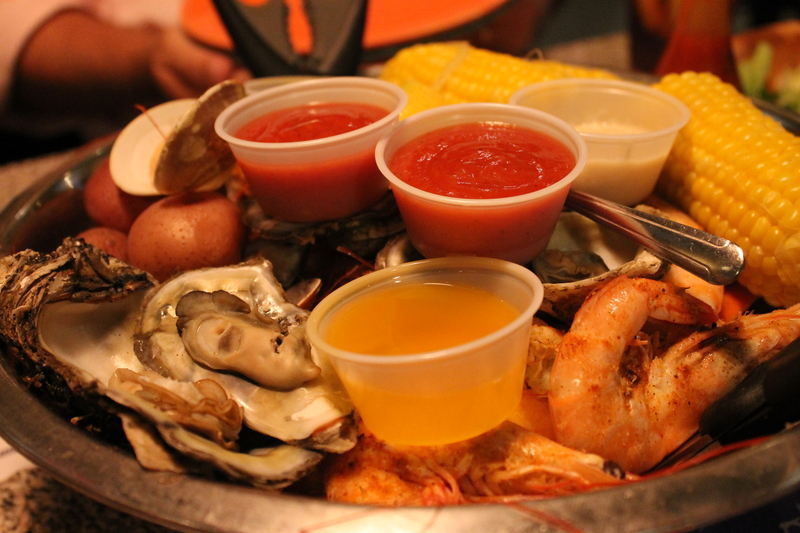 When we went to Destin, we saved our meal at The Old Bay Steamer for the end of the week. We were saving the best for last after our last experience there a few years ago. We Loved it then, and we couldn’t wait to be there again this time. However, the best was not to be last and the second time was not a charm. The place hadn’t changed a bit but most places don’t. We even sat at the same table as last time. 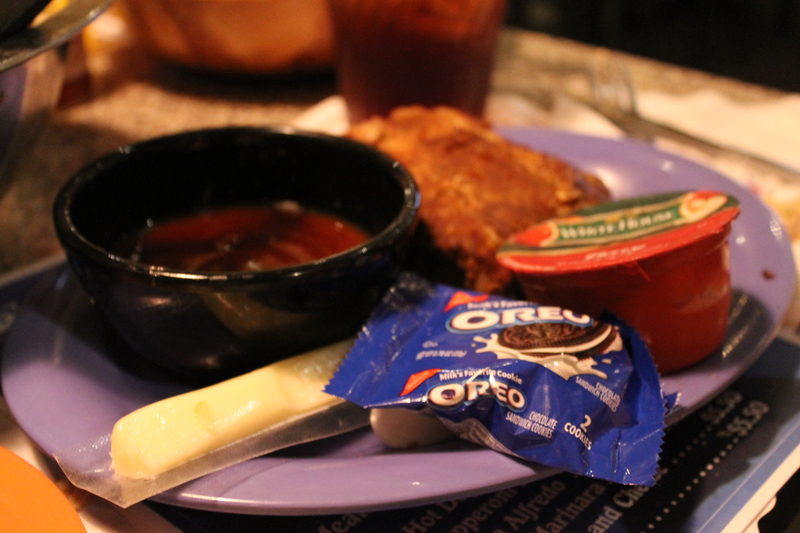 Unlike last time, we ordered the dip combo for an appetizer. The tuna dip was good (not as good as Harbor Docks though), but the tortilla chips that came with the dip were awkward and not as good with it as the crackers from the table. The blue crab dip was blech. Now, I have watched Chopped a time or ten, and it is my understanding that fish and cheese should not mix. This dip had fish, too many onions, and cheese. Weird. I may not be a smart woman or a judge on a food competition, but I know what bad crab dip is. 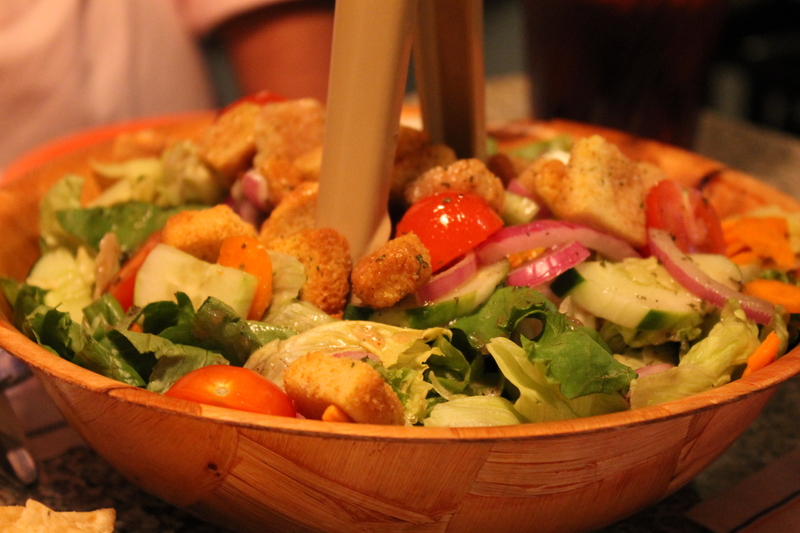 The house salad was as good as last time. I had three helpings. Yum. However, we didn’t drive all this way to visit the Gulf for salad. Miss Helper had the ribs again, and she picked them clean. Then she helped us with our supper. Time to move her off the kids’ menu, I guess. 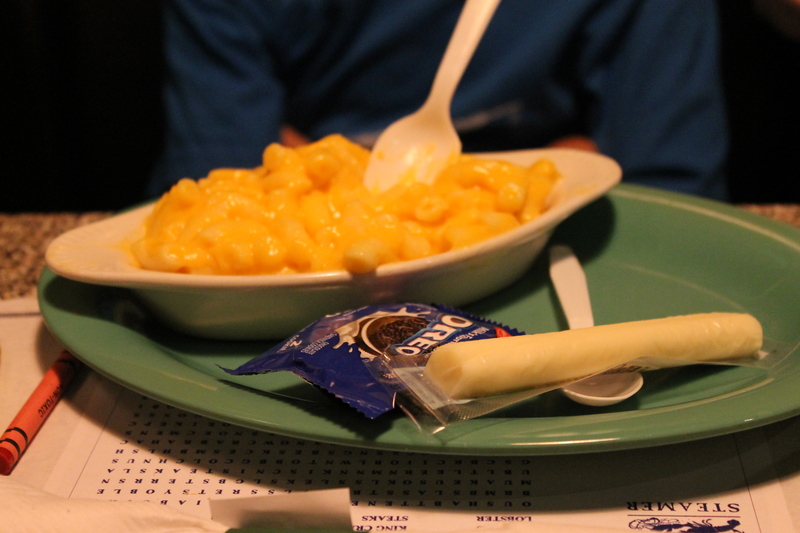 Mr. Picky had the Mac and cheese. He didn’t like it. He said it was weird and the macaroni was too big. Now, he will not eat a lot of foods, but he knows Mac and cheese. If he said it was weird, you can take that to the bank. The Hubs and I ordered the Big Steamer for two. I was so looking forward to this. I used to dream of the experience of sharing a Big Steamer with my man-that doesn’t sound very romantic though, does it? Anyway, we were so excited about it. Then, we tried it. The crab legs were to die for. The best ever. The shrimp? The mussels? The clams? 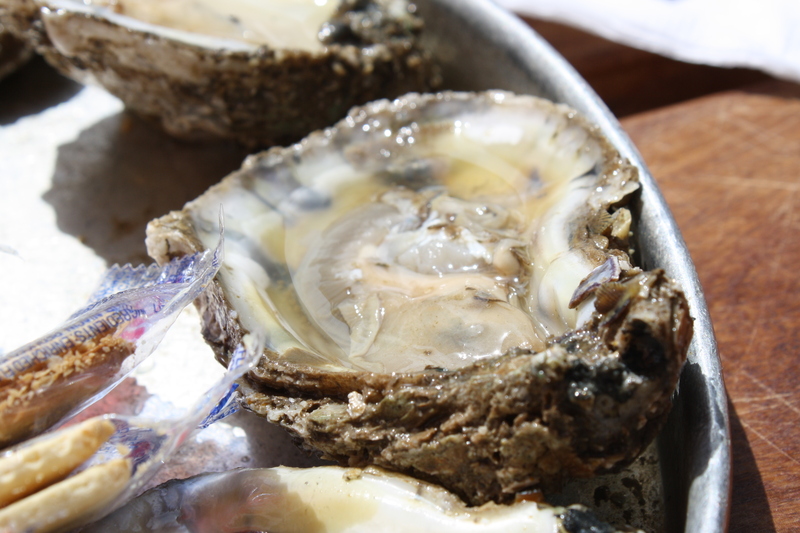 The oysters? Not good. They had a twang that should not have been there. The oysters were especially off. The mussels were my favorite part last time, and I didn’t even eat my share. 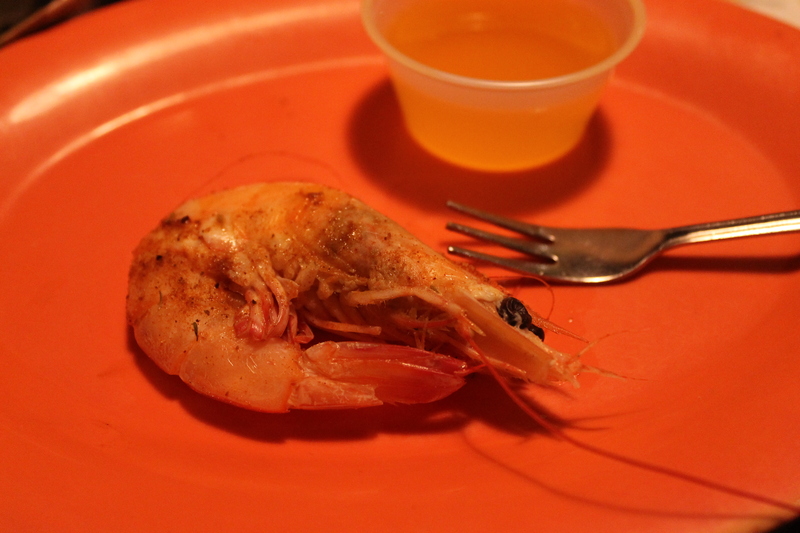 We left several shrimp in the bowl, uneaten. Now, that is just a crying shame. After all was said and done with this meal and the uneaten shrimp were taken away, I noticed Mr. Opinionated, the man I had looked so forward to sharing this meal with, eating a cracker with hot sauce on top. He was still hungry, and so was I. This meal set us back a lot of money, and we walked away hungry. Boo and hiss. That may be the saddest part of all. Our second opinion of The Old Bay Steamer? Well, I won’t be fondly dreaming of it until the next time. A half a dozen times, we have driven to the shore. A half a dozen times, we have eaten at the Shrimp Basket. A half a dozen times, I have ordered the crawfish platter. A half a dozen times, it has been the best meal ever. Why mess with success? I am all for branching out and trying new things. It is one of the things I like about myself. But this? This meal is not to be messed with. My husband and I first ate it by mistake. We were at the beach in Gulf Shores for a short trip, when one night we got hungry really late. 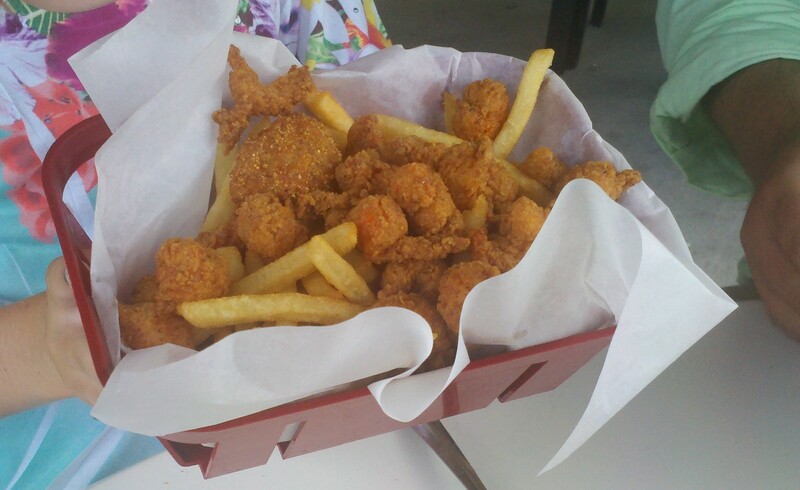 We drove the short trip from our hotel to the first place we found that looked good-The Shrimp Basket. I ordered the crawfish basket while he ordered something else, and we took our food to go and ate it on the balcony overlooking the gulf at our hotel. It was one of our favorite moments of the trip. Coincidently, nine months later our first child was born. That doesn’t have anything to do with this meal. It’s just a nice part of the story. There won’t be any such surprises on this trip, we can hope. We did try something new for our appetizer. We ordered a dozen steamed oysters. 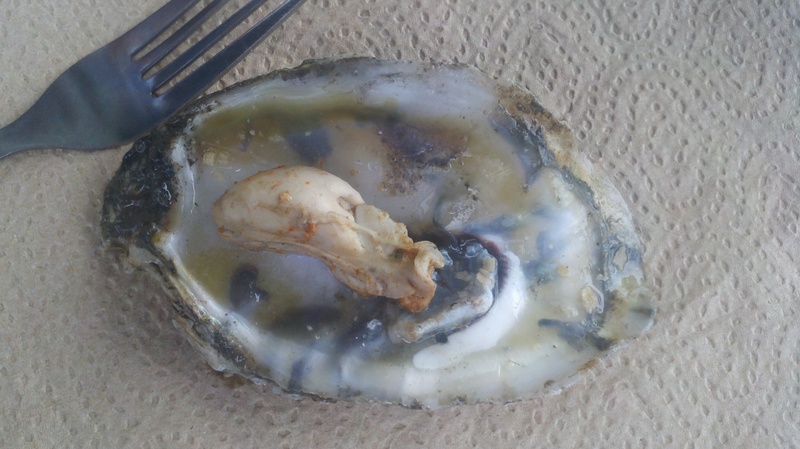 Now, I lova some oysters, but these were not my favorite. 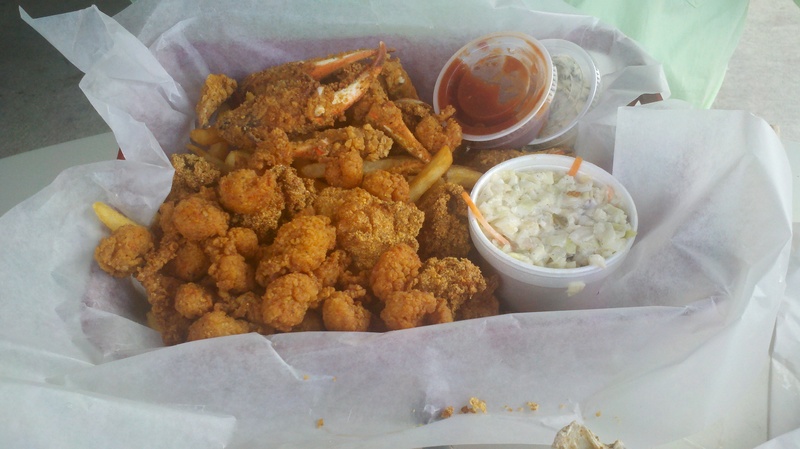 The last time we ate at the Shrimp Basket, the Bama oysters were not my favorite then. Today they were flavored weirdly and were a little bland. That’s okay, though, because our entrees were next. My crawfish platter was as good as ever. 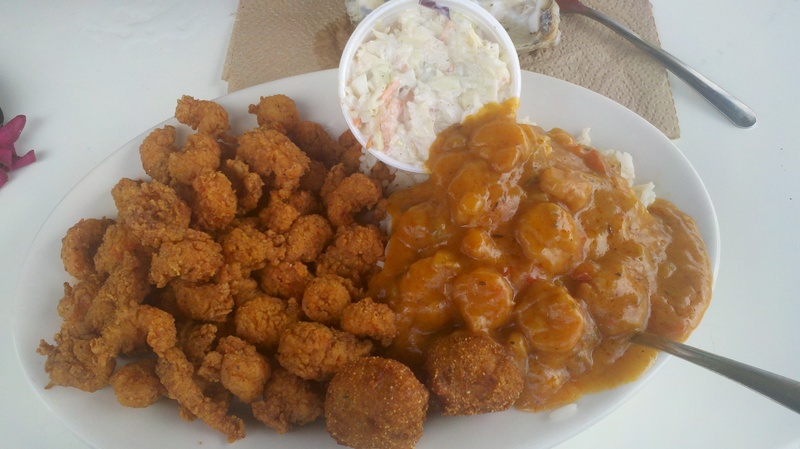 The etoufee is to die for, and the crawfish tails are better here than anywhere else. 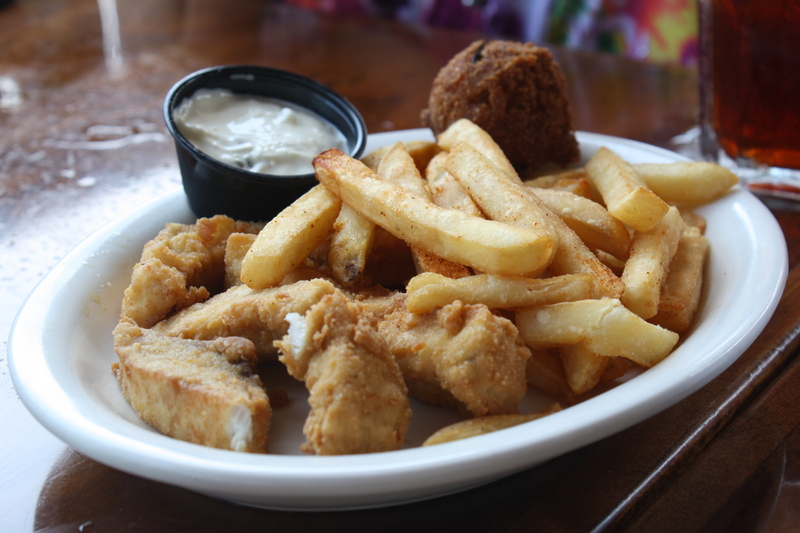 Mr. Opinionated had the fried basket with crawfish, oysters, and crab claws. Miss Helper had the crawfish. Mr. Picky had the grilled cheese. But-he did try a crab claw and HE LIKED IT! He gets fifty cents for trying one. We’ll try anything to get him to try something new-except change my order at The Shrimp Basket. I can’t wait for visit #7. Day 2 of the Vacation of the Year. The beach, the sun, the food. 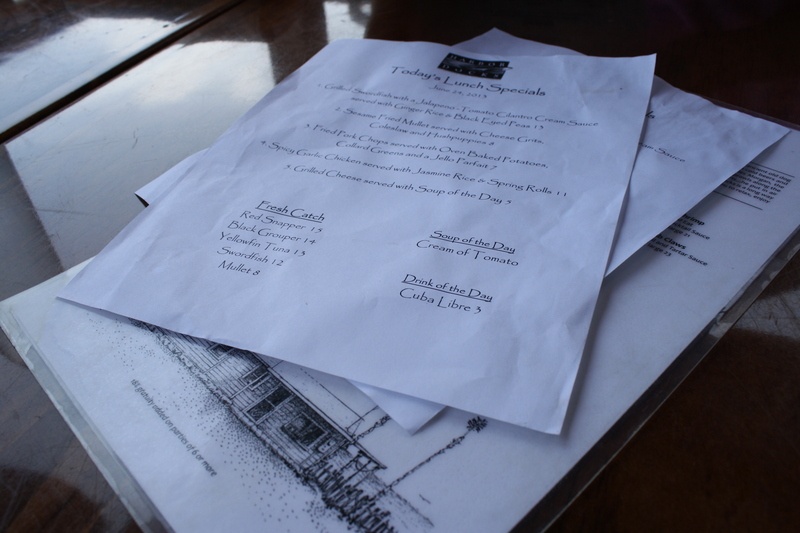 Lunch today was at a place new to us-Harbor Docks. A friend recommended it last time we were here, but we just didn’t get to it. Then, we had a hard time with this place, not because we couldn’t find it or anything like that. No, we had a hard time remembering what it was called. The Harbor? The Dock? The Fishing Dock? After a while, all of the seafood places (and the condos) around here sound the same. But, we found it and the four of us walked right in to Harbor Docks for a late lunch. Our first table was a dark, quiet one inside surrounded by a lot of blue haired old people. No view, no breeze. Nevermind that. Our second table was much better. We ate outside in the open air surrounded by some lady on her phone and a younger lady who was apparently napping. 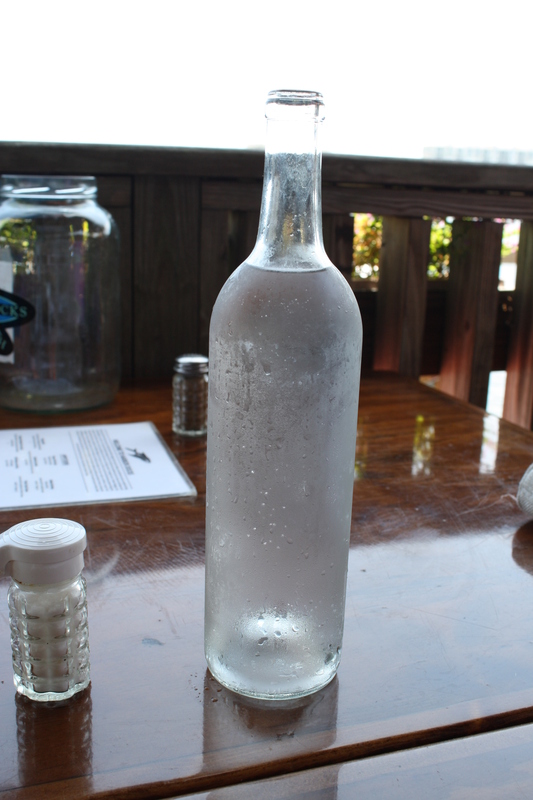 Our waiter was a nice young man who started us of with a nice bottle of cold water. They don’t do that at restaurants anymore, and it was nice here. Really, even the water was impressive. 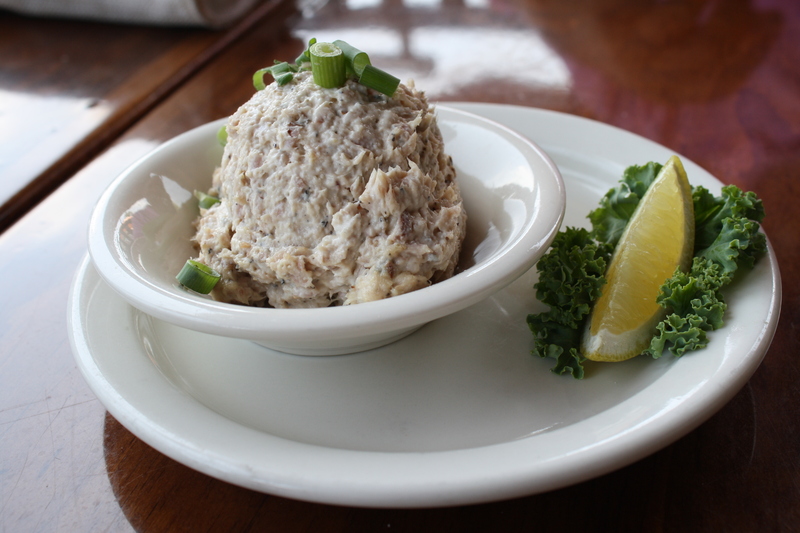 After looking at the menu, we chose the smoked tuna dip as an appetizer. I have an acquaintance who makes a tuna dip. A lot. I swear every time a potluck comes up, the tuna dip will be there. That tuna dip was what I was expecting, but what we got was far, far better. The tuna was fresh caught and smoked on sight. It was so, so good, and it didn’t last long. 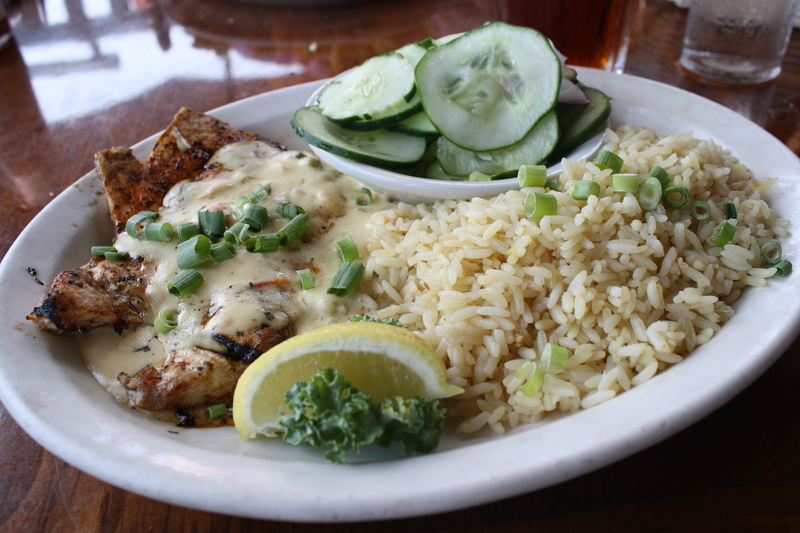 I had one of the specials-the grilled swordfish with jalapeno-tomato cilantro cream sauce with jasmine rice and cucumber salad. It was very similar to what I ate at The Back Porch, and just as yummy. When I order something with jalapeno, I know that I always run the risk of getting something too hot and spicy. This dish was a little on the spicy side, but not too much. I could handle it thanks to that tall bottle of complimentary water. 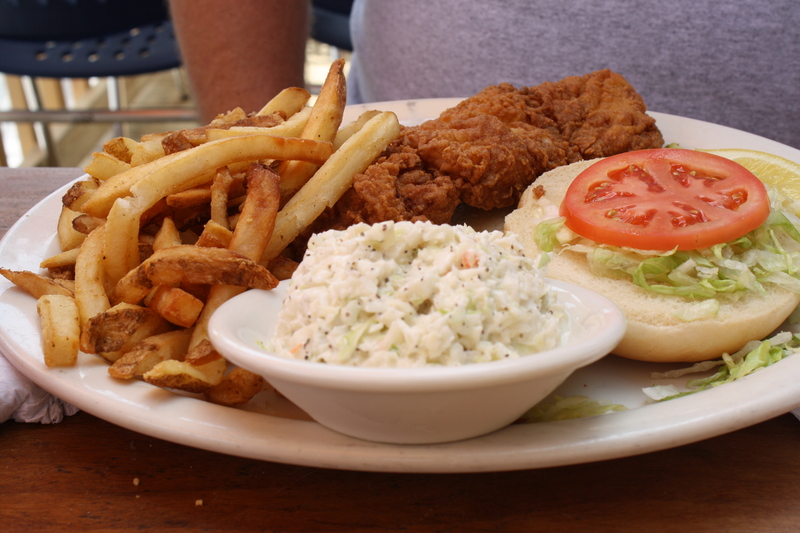 Mr. Opinionated had the fried red snapper sandwich. Again, very similar to the day before. It was good but not as good as the fried grouper at The Back Porch. Miss Helper branched out a little and had the fried swordfish. She loved it. Mr. Picky again had the chicken fingers. I see a pattern here. Our lunch was very, very good. 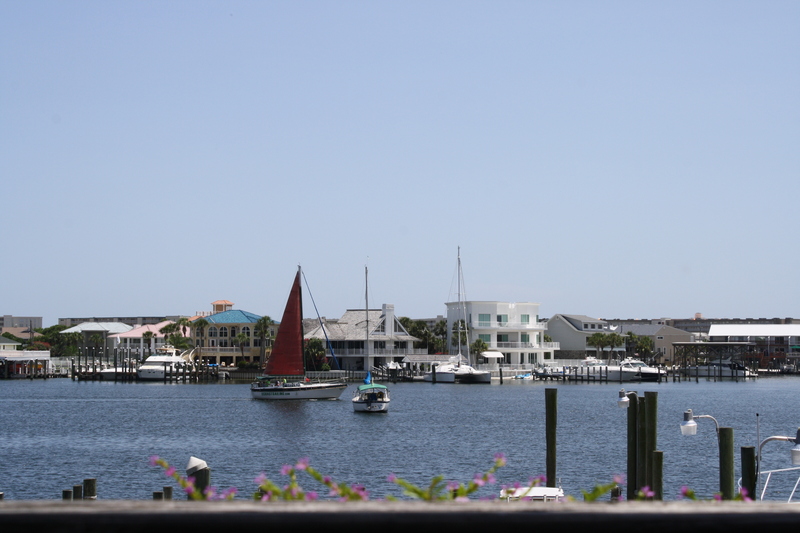 Harbor Docks is a keeper on the permanent list of places to eat while in Destin. When the meal was over, we sat back in our deck chairs-happier and chubbier than we were when we walked in. Our waiter asked about dessert. We hardly ever get dessert and so the answer was a no. Then, he mentioned the homemade key lime pie and the homemade white chocolate bread pudding. 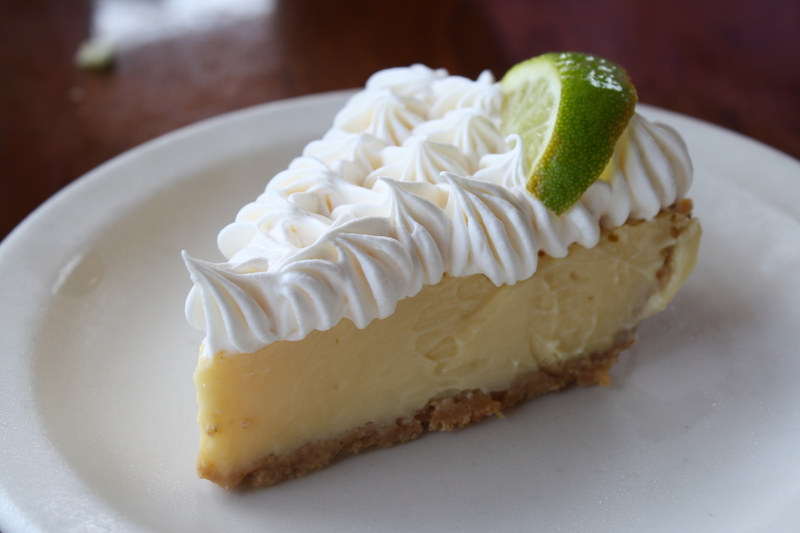 The key lime pie was good. A little on the tart side but not in a bad way. 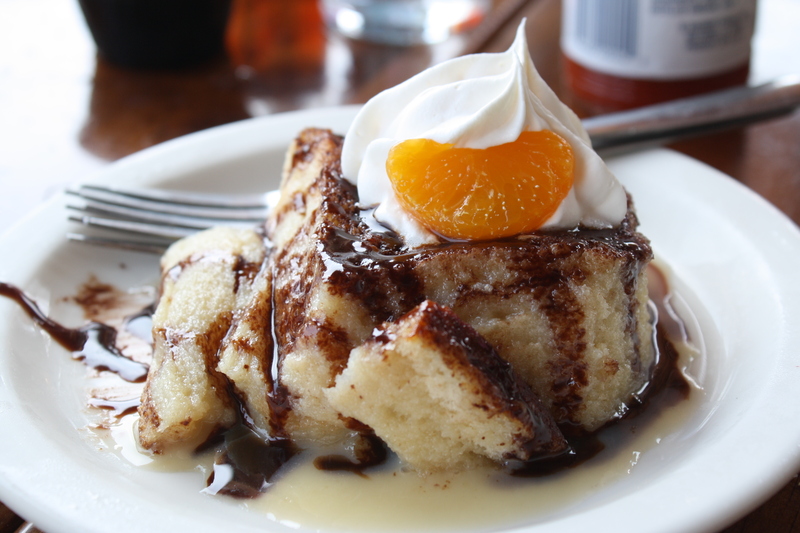 The bread pudding? Good Lawd. I have never had dessert like this. It was super moist and divine. I was as full as a tick but I still could not leave any on the plate. It all had to go. When I complimented the waiter on the bread pudding, he started talking about how easy it was to make. He kept talking and I thought he was going to give me the recipe. I guess we’ll just have to drive back again someday. 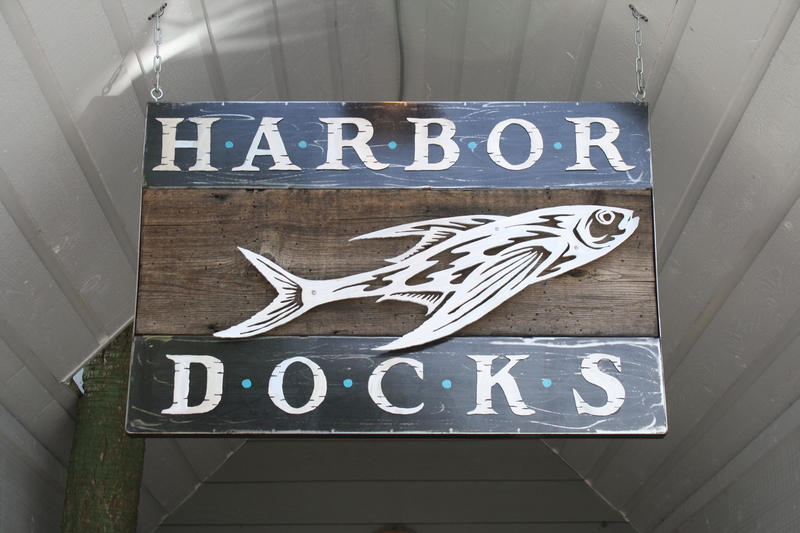 Harbor Docks is a name we won’t forget again anytime soon. So, we have driven what seems like the equivalent of the Lewis and Clark Expedition, and we are back in our beloved Destin, Florida. Land of sunny skies, white sand, and awesome restaurants. After driving several days and enduring hours in the car, we made it. First stop-to eat! My policy on vacation is no Mexican food, no restaurants that we have back home, no places that offer a coupon via brochure, and no cheesey chains. Fudpuckers? Hooters? Harry T’s? Um, no. 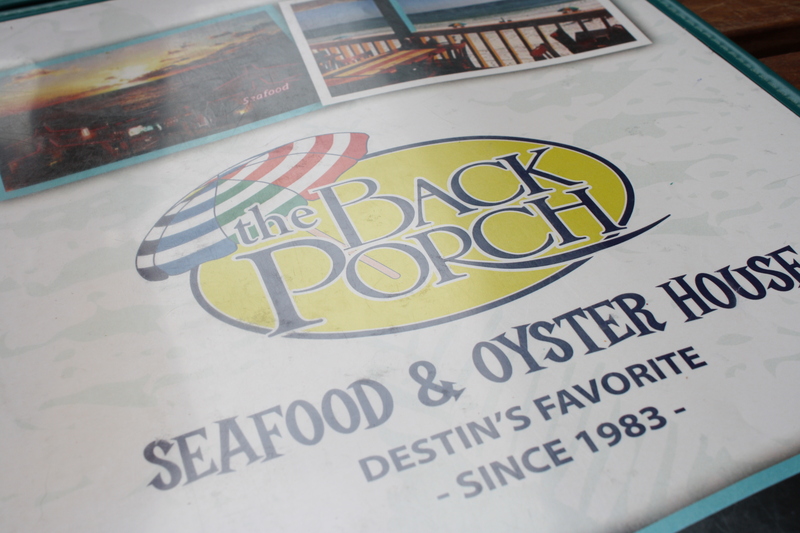 We went to The Back Porch for our first meal, and we walked right in, took a table outside, and ordered. 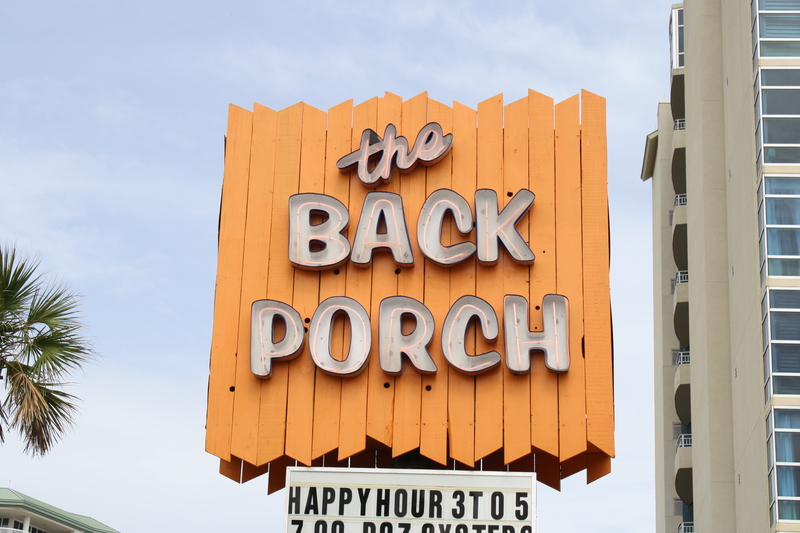 We had eaten at The Back Porch before. Just like last time, it was fabulous. 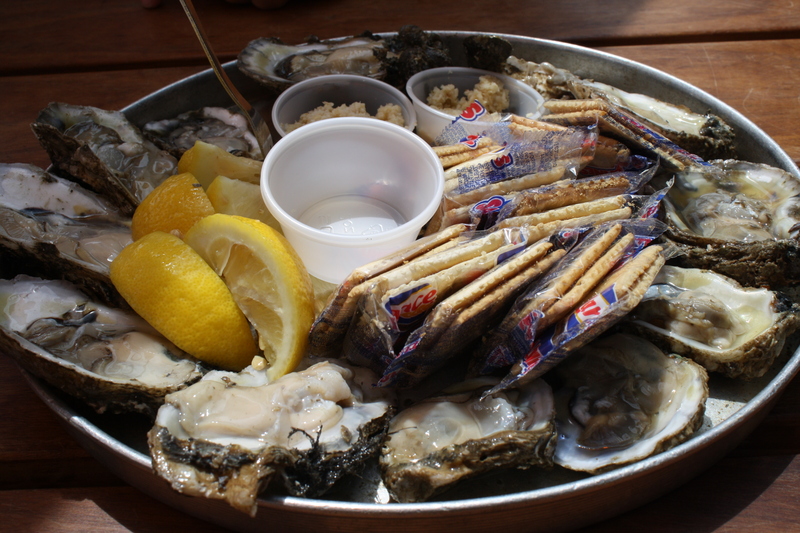 We started with the oysters. Fresh and delicious. 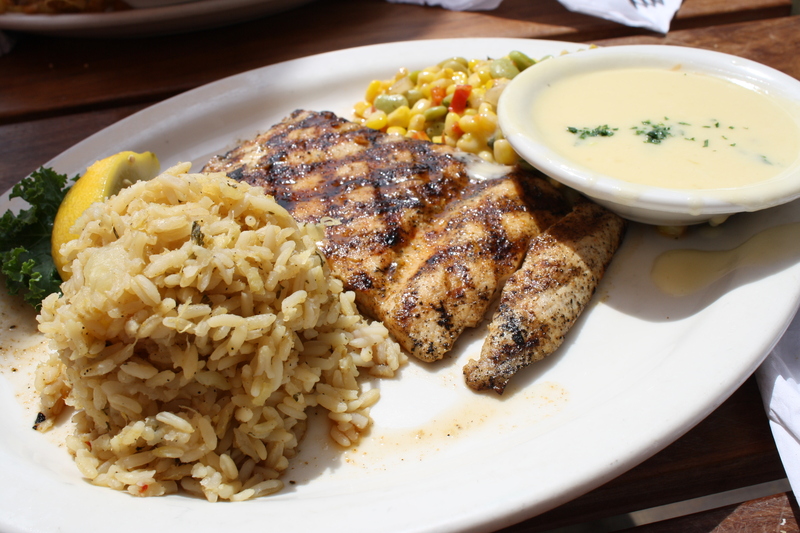 I had the grilled mahi-mahi with the pineapple rice and lemon-caper beurre blanc sauce. It was divine. The fish and the sauce were wonderful together, and I was glad I got the sauce on the side as it was a little runny. I ate the whole thing even though I told myself that the sauce was full of butter and was horrible for me. 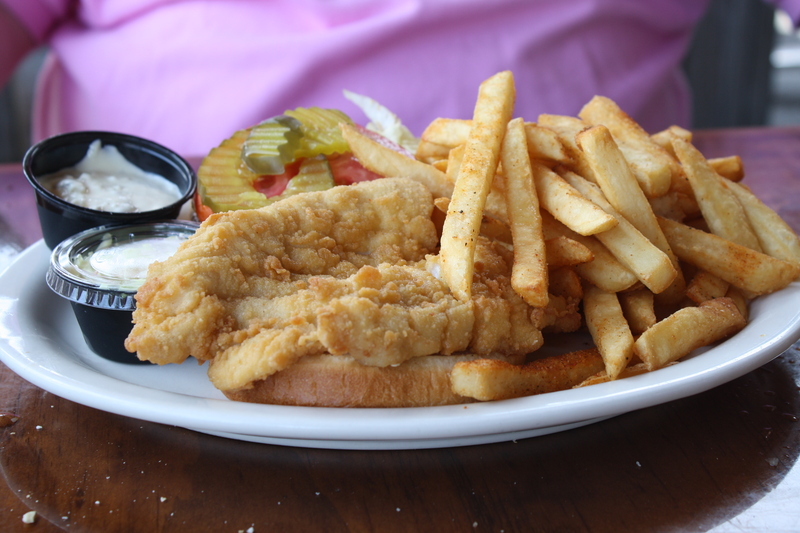 Mr. Opinionated got the fried grouper sandwich-his favorite beach food. 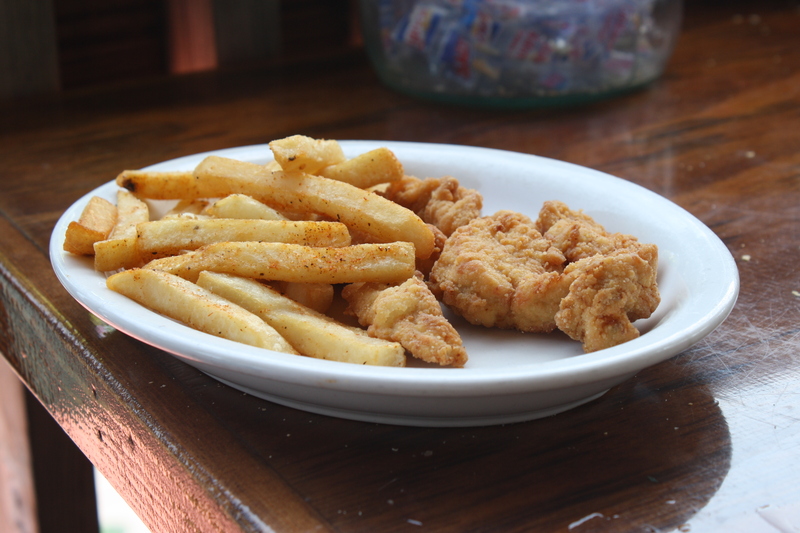 Miss Helper got fried shrimp, and Mr. Picky began his culinary tour of the gulf with chicken tenders. We were a little disappointed that we didn’t see any of the cats, and the trash on the side of the restaurant from the restaurant was gross. The Smell was still there too. Even with all these flaws in our experience, The Back Porch alone was worth the drive. But, I can’t stop here. We are looking forward to more food and fun. The hubs and I recently had a nice getaway to celebrate our anniversary. We rented a beautiful condo and enjoyed the peace and quiet of being alone with no kids. We spent our mornings walking around town looking through the quaint antique stores. It was a lot of fun. Also, of course, we ate. 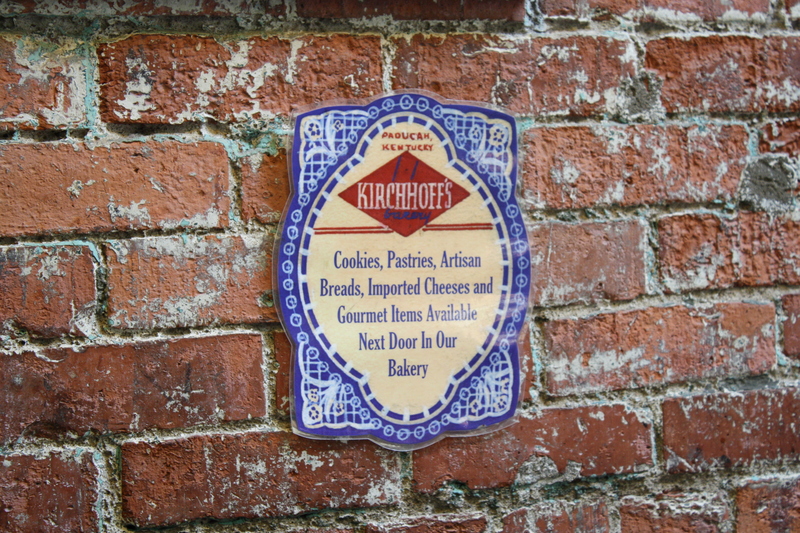 We had a great, yet awkward lunch at Kirchhoff’s, a deli/bakery/coffee shop that the lady who rented our condo to us recommended. It was awkward because it was slightly confusing to order, but it was no big deal at all. The place was busy and nice. The smells of bread and coffee were great, and we enjoyed a nice rest from all that shopping. 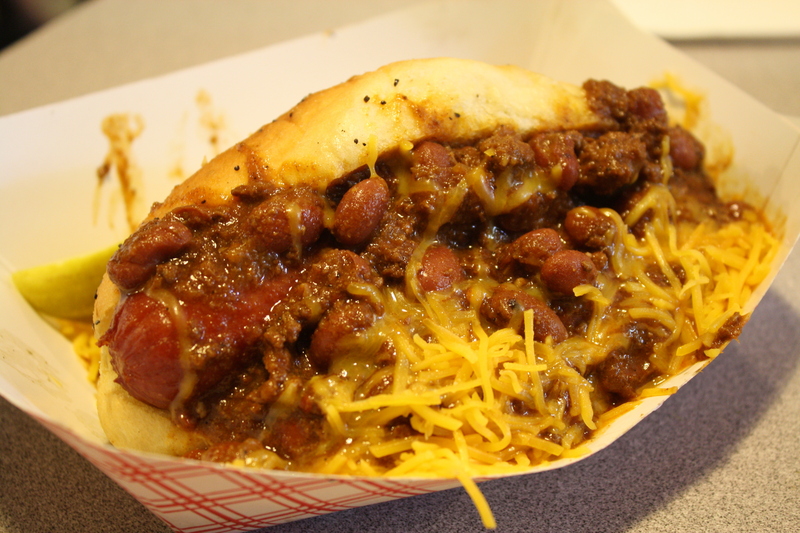 Mr. Opinionated ordered the chili hot dog, and he was pretty happy with it. 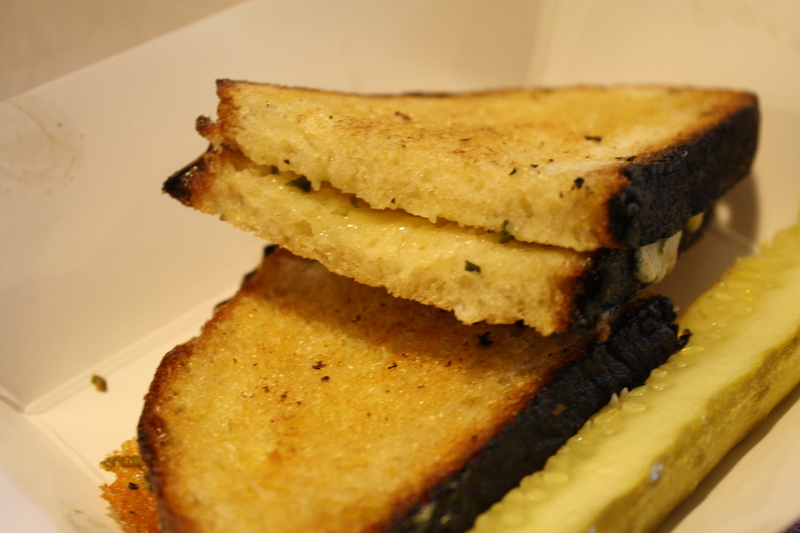 I enjoyed the horseradish and chive havarti grilled cheese. As you can see, it was slightly burned and lacked most of the cheese, but it was still good. You can’t beat a good grilled cheese. Later for dessert, we stopped by the sweetest little fudge shop where we were helped by the sweetest two ladies who must have been sisters. And may I say, peanut butter fudge may be the best food ever created in the whole entire world. These ladies here, they know how to make it. 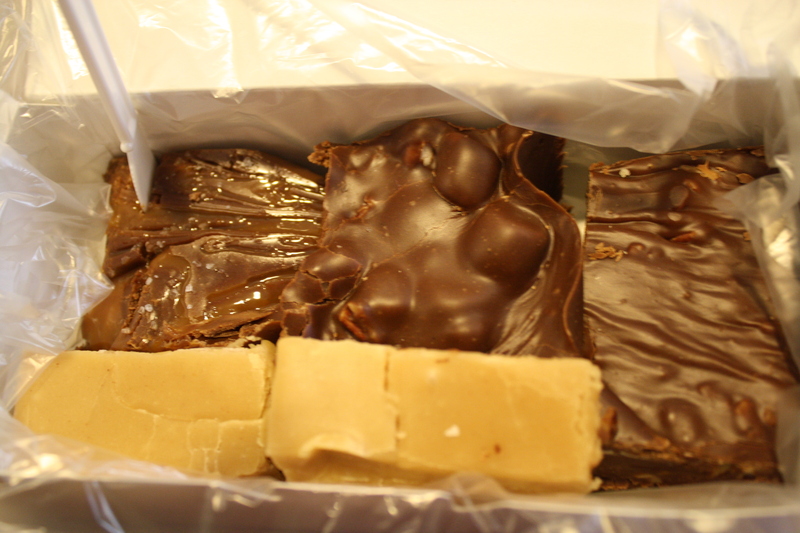 We bought the variety box of four types of fudge. Since it was our anniversary, we each picked two types. I picked the salted caramel and peanut butter. The hubs picked rocky road and pecan. Ah, the joy of sharing fudge with the love of my life. Yeah, right. My fudge was better, and I shared it with no one. Love means never having to share peanut butter fudge. 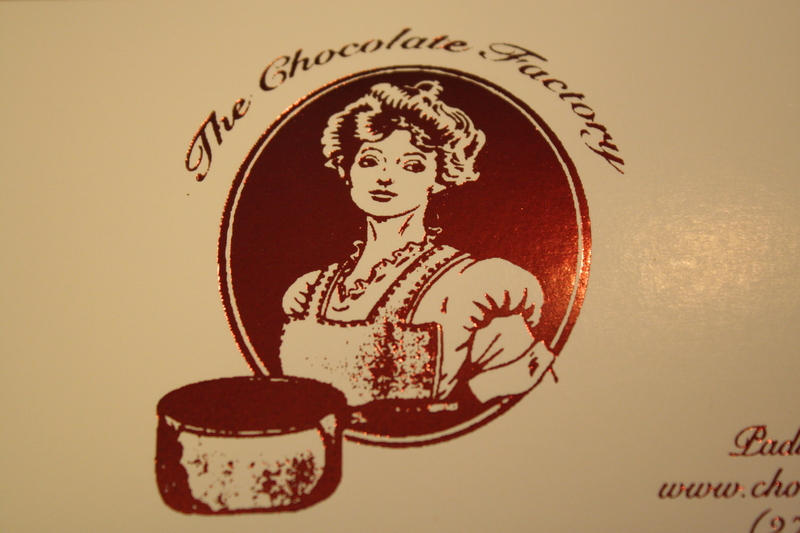 We had a great time, and I would highly recommend both of these delicious stops. It was a great foodie trip. While on vacation, we went to The Hangout once for breakfast. It was fun, fun, fun. Before we left, we picked up a menu. We do this a lot to remember where we have been and what we ate while there. 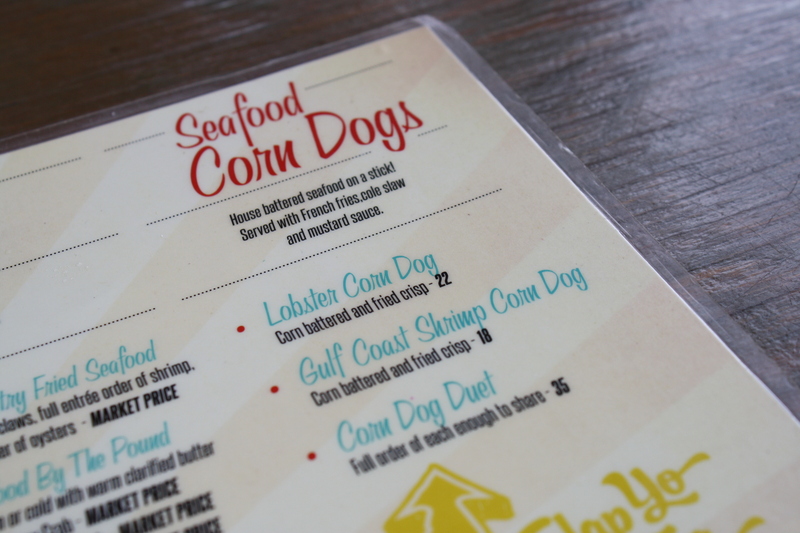 When we returned to our vacation house, we looked over the menu, and I spotted a dish I had to have-the shrimp and lobster corn dog duet. I had to have it-all $35 worth. So, we went. 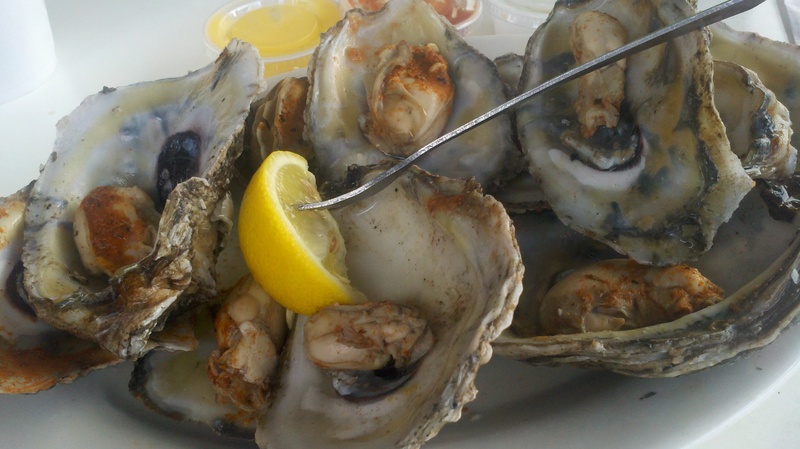 When we returned for lunch later in the week, we started with the oysters. 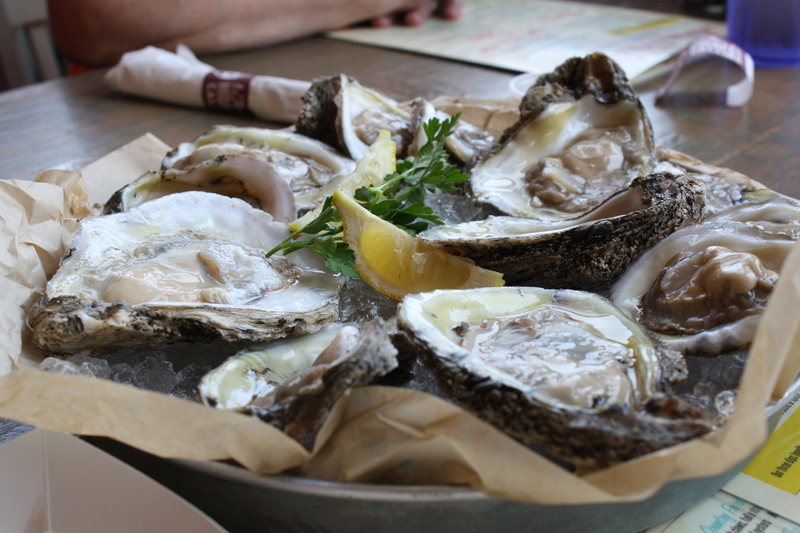 I think we ordered oysters everywhere we went, and these were some of the best. We also had the fried pickles. 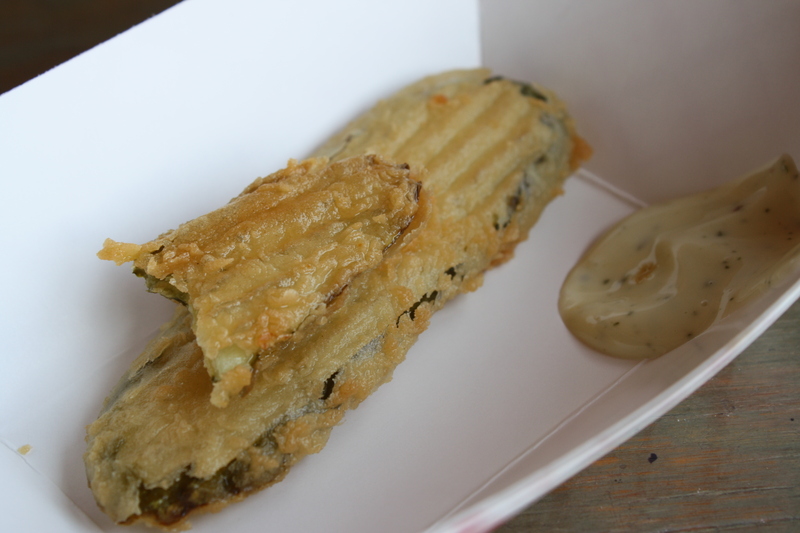 We are fried pickle people, and we liked how these were sliced long and thin. Then, our entrees came. 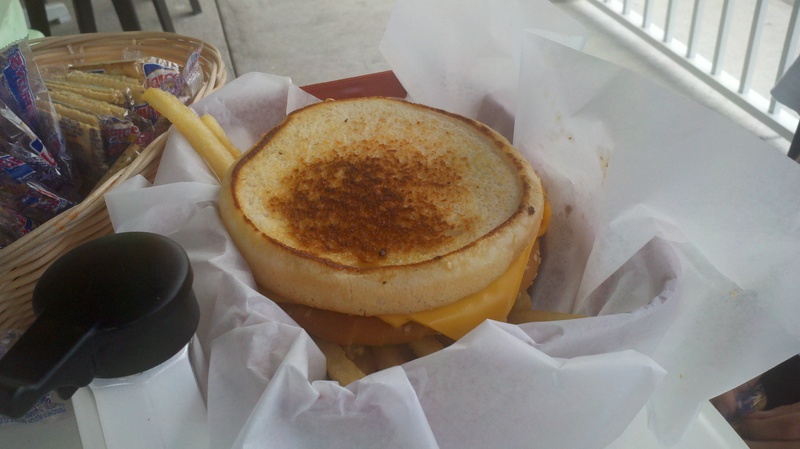 Mr. Picky continued his grilled cheese tour of the Gulf. Miss Helper had the shrimp. Mr. Opinionated had a burger-the size of his head. 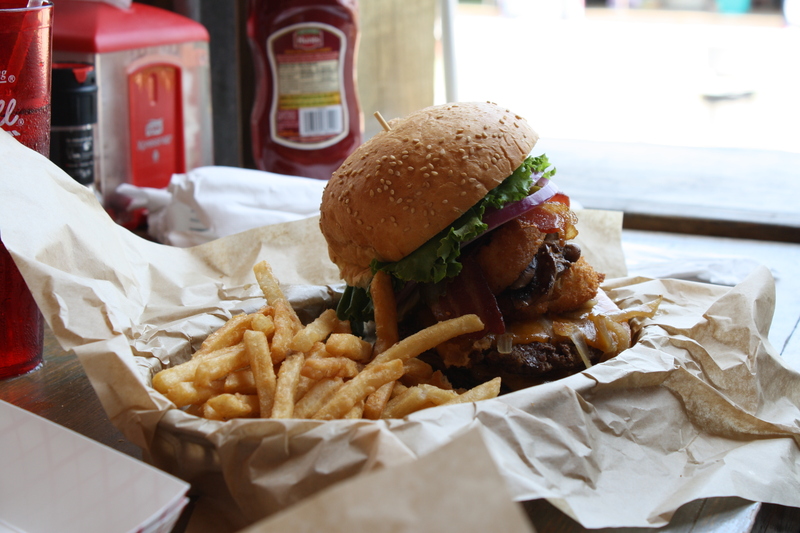 He ranked this burger second on his list of all-time best right after the burgers we had on the way to vacation. It was a good trip for burgers. 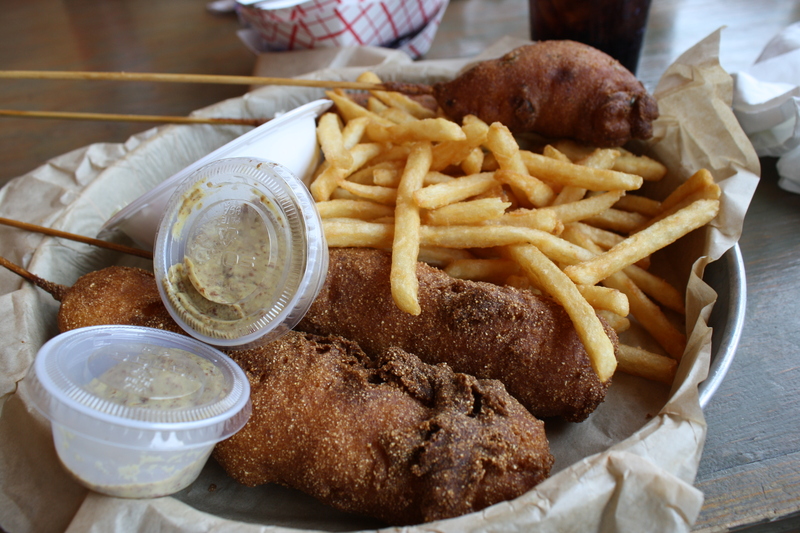 I had four corn dogs-two shrimp and two lobster. The lobster corn dogs were good and sweet, but my favorite of the two was the shrimp. 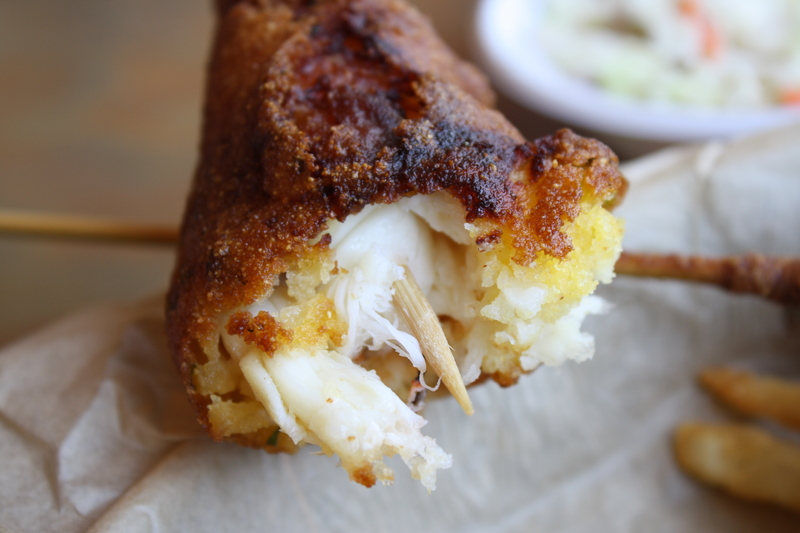 Eating a shrimp corn dog was not unlike eating regular fried shrimp, except for the stick. I think the stick added a fun, yet dangerous quality. Plus, Mr. Opinionated has always said that meat tastes better on a stick. I agree. The Hangout has turned into a special place for us. I love it-the food, the fun kid activities like playing in the foam, the gift shop. Fun. I hope it replaces our normal first stop when we visit the gulf. When the bill came, our total was over $100 for lunch. Sheesh. But, we had a fun time, we all enjoyed our meals, and I got to try something that I had never even heard of. In my opinion, that makes for a great lunch.